CHICAGO – I understand why they did it. But that doesn’t make it right to do. In order to earn sign-off from Chris Kyle’s family and the U.S. Navy – and to appease the patriotic American public – “American Sniper” needed to make the U.S. military’s most lethal sniper nicer than he actually was and generalize a people as people you should hate. Military men and women certainly make great sacrifices to protect us at home and we should be very appreciative. Some pay the ultimate price with their lives. But rather than being truly honest to the subject matter, the film glorifies it, sugarcoats the truth and creatively changes details to assure we see the hero Kyle was without most of the much darker anti-hero he also was. Disturbingly, “American Sniper” director Clint Eastwood decided to ignore Kyle’s lies like they never existed. Kyle said in his autobiography that he sniped looters during Hurricane Katrina, killed two carjackers in Texas and punched Jesse Ventura in the face. None of that was true and Eastwood ignored it in the film. Documentaries have a responsibility to be honest and objective. Why doesn’t this action/drama film? Kyle would still be seen as a hero even if Eastwood honestly and ethically exposed Kyle’s lies. Instead, the film loses credibility for being a true story that is only a half truth. Bradley Cooper as Chris Kyle in “American Sniper”. Furthermore, while the film doesn’t overtly say or even necessarily intend to portray the thought that “all Iraqis are terrorists,” which certainly isn’t true, it feels that the film is primarily showing that. It does attempt to counter that implied perception by taking you behind the scenes of one Iraqi local. The film portrays this Iraqi father as having a heart and being afraid of his own people as much as the Americans who hate him. But still, the majority of the film makes you feel like “these are bad people” and “you should be afraid of them”. Some of them are bad people – like you will find within any group of people – but the film fails to differentiate extremists you should fear and hate from the everyday people you shouldn’t. You could just as easily zero in on a group of Americans who are equally bad people, but the agenda of this film is to illustrate an American hero, make you feel sorry for him and hate his enemy. The danger of a film focusing like this is it lacks objectivity and instead resorts to one-sided propaganda. Brad Cooper (left) as Chris Kyle and Sienna Miller as Taya in “American Sniper”. The film’s lethal oversight is in what is left out. While no one is a perfect man or woman and Chris Kyle certainly is no exception, you don’t get a true sense of who he was. The film typically gives him the perfect, calm line to say to his wife and he never misses a shot in war. This man is good, but he’s not flawless and the film glazes over his many imperfections. You can tell he’s often holding back. The film eventually explores his post-traumatic stress once he’s back on American soil after a few war tours, but it completely leaves out his right-wing politics and much of his anger and hate. Had this been a documentary, this story would have looked very different. Done by an honest filmmaker, it’d have been truthful and objective. But then it wouldn’t have come off as much as a “hero film” and it would have felt much more bittersweet. Movie studio and U.S. Navy politics clearly held this film back from being an honest portrayal both about who Chris Kyle really was and the truth about the people he was fighting. 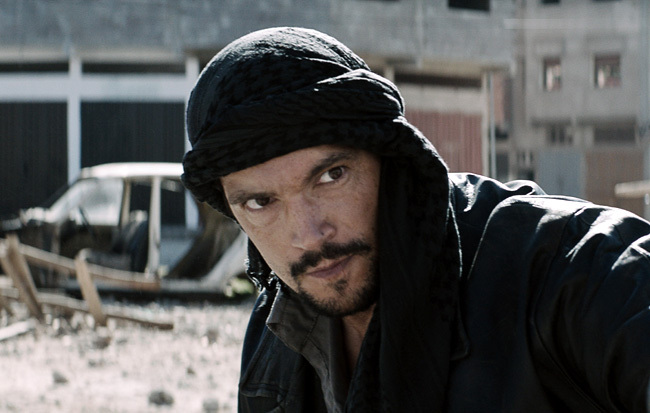 Mido Hamada as The Butcher in “American Sniper”. Despite the lack of objectivity, this is an entertaining, tense and thrilling film that has been nominated for 6 Oscars. You do root for Kyle. You do want him to get the bad guys – the guys who really are bad – and you do feel protective of his brothers-in-arms for whom he provides critical eye-in-the-sky snipe support. You also very much feel for his kids at home and his wife – played perfectly by Sienna Miller. Without knowing any of her backstory, that’s exactly how anyone at home – man or woman – would feel with their spouse far away in the fog of war. She doesn’t understand why it’s so important for Kyle to fight and kill for his country for so long. Eventually she realizes and breaks down to Kyle that his job is to be home with his wife and children more than fighting for the U.S. The film does honestly show Kyle’s struggle between his two homes – one overseas at war and another on American soil with his family – and the remarkable part of his story is his tough choice in the final act. Given that choice, how Eastwood quickly wrapped up the film’s true-story ending feels quite abrupt. Eastwood clearly didn’t want to focus on the critical conclusion. Sienna Miller as Taya in “American Sniper”. For an Eastwood film, “American Sniper” feels out of character. It’s not as slow as his films typically are. With Kyle as a Texas cowboy, it returns to a similar feeling as Eastwood’s 1992 gunslinger film “Unforgiven” but with the modern overlay of terrorism and war. As for Bradley Cooper as the film’s central character, he puts on a heavy Texas accent and plays the role with deliberate patience and control. Rarely does he let loose emotionally, which I would have expected to see more of, but the character certainly is a more challenging and career-growing role than the work he’s known for recently with “The Hangover” films. But Cooper as Kyle has two scenes in the film that especially rub the wrong way. A critical scene in which Kyle impossibly takes on his direct sniper rival – from one mile away – is slowed down and glamorized “The Matrix” style instead of being portrayed without Hollywood’s makeup. But the biggest joke of the whole film is the now-infamous “fake baby scene”. Cooper so obviously flails about a baby doll instead of his child because two “real babies” didn’t work out. Screenwriter and executive producer Jason Hall has been quoted as saying: “That plastic baby in ‘American Sniper’ is going to be rationalized by Eastwood auteur cultists until the end of days. I hate to ruin the fun, but real baby #1 showed up with a fever and real baby #2 was a no-show. [Clint voice] Gimme the doll, kid.” Perhaps there are more than two real babies in all of Hollywood? “American Sniper” stars Bradley Cooper, Sienna Miller, Kyle Gallner, Jake McDorman, Mido Hamada, Luke Grimes, Navid Negahban and Keir O’Donnell from director Clint Eastwood and writer Jason Hall based on the book by Chris Kyle. The film, which opened on Jan. 16, 2015 and has a running time of 132 minutes, is rated “R” for strong and disturbing war violence and language throughout including some sexual references. Submitted by N. Moffat (not verified) on January 20, 2015 - 12:44am. Submitted by HollywoodChicago.com on January 20, 2015 - 12:13pm. But the biggest joke of the whole film is the now-infamous “fake baby scene”. Cooper so obviously flails about a baby doll instead of his human child because two “real babies” didn’t work out. Perhaps there are more than two real babies in all of Hollywood?